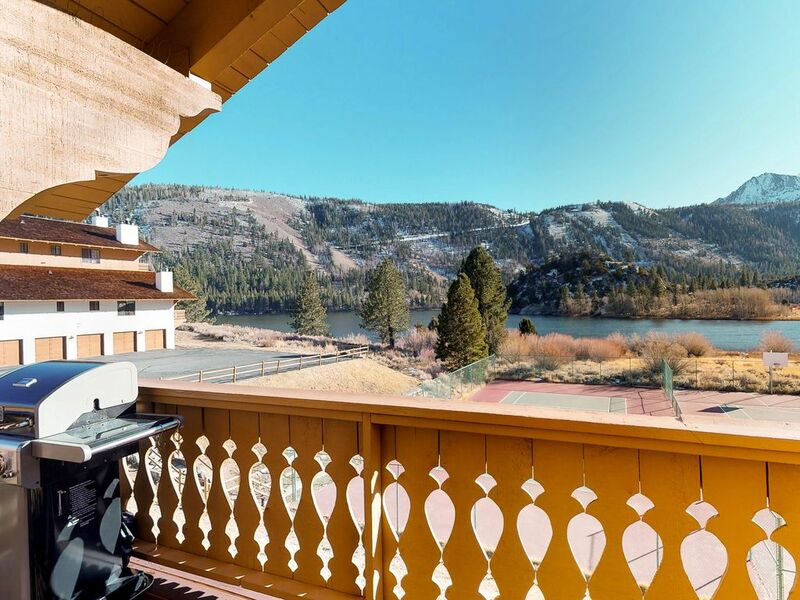 Head to beautiful June Lake and make this lovely condo your home base for a peaceful and fun mountain retreat. Not only will you enjoy gorgeous views from your private deck, you'll be in close proximity to two lakes and the slopes and have access to a shared hot tub. In the summer, walk to June Lake and do some swimming or Gull Lake for kayaking, paddleboarding, or sailing. Hiking is plentiful in the immediate area, and Yosemite National Park and Ansel Adams Wilderness provide even more options. Do some exploring and find the natural hot springs in the area for a relaxing treat after a day of rock climbing. In the winter, pack up the skis and boards and head two miles southwest to June Mountain Ski Area for fun-filled days on the slopes. When you're home, get comfortable in the living area and warm up with a fire while you watch a show on the flatscreen TV or use the free WiFi. Hang out on the deck with a cold drink when it's warm outside and revel in the views. If you're in the mood for some alone time, wander off to the master bedroom and recline on the chaise lounge, where you can also take in lovely views. The full kitchen has stainless appliances and is ready and waiting for you to cook up delicious, hearty meals for your group. Book this desirable condo today and start making plans for your restful, rejuvenating June Lake! Parking Notes: You can park anywhere in the complex. No pass is required. No garage access. Great condo, lots of space. Excellent stay, no problems- great view. High quality cabin. Everything was great - kitchen and bathrooms were new and very nice, beds were new and firm. Very clean. Great location, right on the lake. Loved the extra touches, like the high pressure showerheads, the strong hairdryers, quality tiles and flooring, the well-stocked kitchen with quality refrigerator and oven. We just got back from a week in June Lake. We loved the condo. Great location. Lots of space. Beautiful views. We will certainly be back! Thank you for the comments. Deep cleans are done twice a year in the Fall and Spring. Thank you!